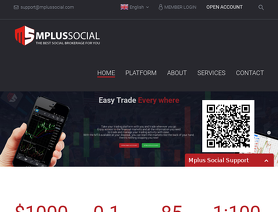 MPlusSocial is a forex broker. M Plus Social offers the MT4 and Mobile forex trading top platform. MPlusSocial.com offers over 40 forex currency pairs, stocks indices, precious metal, commodities and cfds for your personal investment and trading options.